The great beer producing country that is Belgium makes a vast number of beers in countless different styles. Most are known for their intense flavours or colours, but this beer is different. 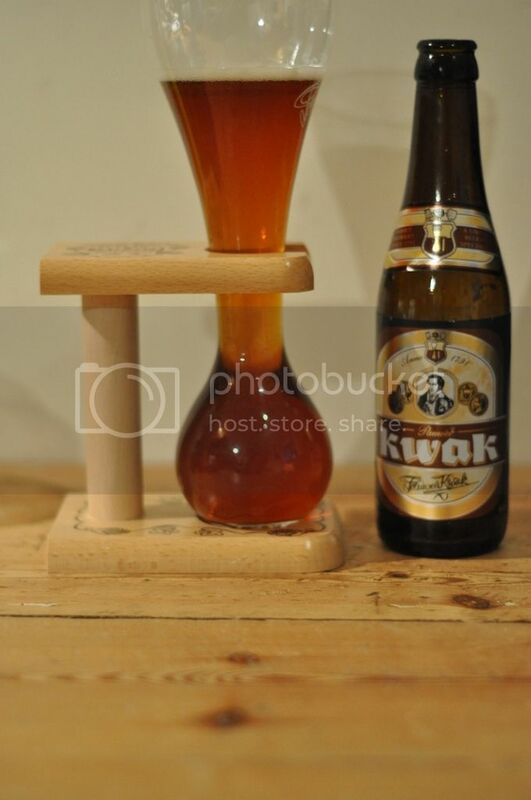 Pauwel Kwak has the unusual distinction of being known more for it's distinctive glass moreso than it's flavour. The basic story behind this glass is that it was designed by a Belgian innkeeper to serve to coach drivers on horseback, who could take a sip and then set the glass in their stirrup. It's a great story and in a country where ever brewery makes their own vessel Kwak have really done well in the marketing stakes to stand out from the crowd. Having recently acquired a couple of these glasses I thought is was time to pour a beer. This beer pours a hazy orange-amber colour with a yellowed head. There is not a great deal of head on this beer, but the head that is there hangs around and laces surprisingly well all things considered. The colour is quite dark for a Belgian style Pale Ale, but it nevertheless is very inviting. ﻿The first thing that hits you when you sniff this beer is a very sweet, caramel flavour. There are pleasant spicy undertones and touches of fruit, but it is quite hard to smell over the caramel. I think the fruits are sultana's and maybe banana, but it's quite hard to tell. The malt smells good and there are no hops to speak of yet. Perhaps a tiny waft of alcohol, but it's very pleasant and adds to the warmth of the brew's smell. This beer proves true to the nose, it's exactly what you would expect after smelling it. Kwak has strong caramel and toffee flavours, which may be a tad sweet for some. The fruits are alot stronger than the aroma seemed, they are strong and vibrant and bring a real tartness to the beer. The predominant fruit is a bitter pear, I find it quite interesting that I couldn't smell it as it is very strong flavoured. A touch of alcohol really warms it up nicely and would make it an excellent desert beer. Overall this is a really good beer. As I mentioned earlier it is very sweet and this may turn some off. 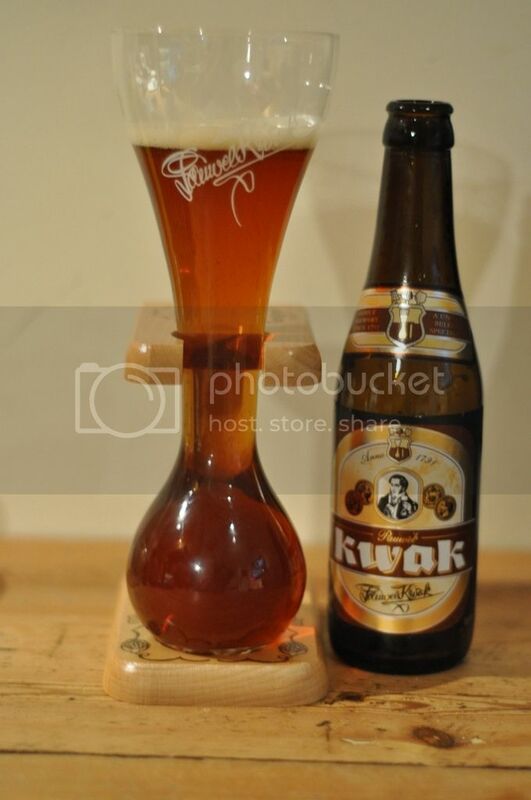 Pauwel Kwak is nowhere near as thick as some Belgian strong Pale Ales and has a medium level of carbonation. It feels really smooth in the mouth and the extra ale makes it probably more of a late evening beer or a beer for winter. Keep it in mind if you are ever after a beer to go with dessert (not that many ever are...). Definitely worth a try for all and a must for beer aficionados.